It’s cold and flu season! And allergy season is just around the corner. 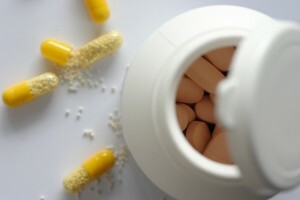 I’m sure you know that after their expiration dates have passed, certain medications (both prescription and over-the-counter) may lose their potency and no longer work. Now’s the time to do a quick clean-out! Before you tackle your out-dated medicine cabinet, grab a pen and paper so you can make a list of anything that needs to be replaced. First, any medicine that is quite visibly old needs to go… that includes bottles that are crusty, sticky or oozing. Once you’ve tossed the obvious items, glance at the expiration dates of everything else. I do think it is important to always have a supply of these medicines: first aid items, over-the counter pain medicine, allergy medicine, cold medicine, and any other medicines that treat any chronic illnesses you might have. But consider this… are there any medications from old or rare ailments that you probably won’t need again? There’s nothing wrong with being prepared for the inevitable. But keeping any other old medications around “just in case” doesn’t seem healthy – mentally or physically. Let me explain. I firmly believe that we are what we surround ourselves with. We really do underestimate the power of our intentions. If you actually intend to be well and healthy, then decide how you’re going to create that reality. Let go of your unhealthy assumptions! Purge medications that represent illnesses that you’ve already healed from and free yourself from any concern that the sickness is going to come back one day. IMPORTANT: Don’t flush any pills down the toilet! Also, never throw loose pills into your garbage as you never know if a child or animal will find them. Here are a few other options… Put them in a zip lock bag and fill it with enough water for the pills to dissolve. Next, zip the bag up tight and throw it in your garbage. Another option is to take the pills out of their original containers and mix them with an undesirable substance, such as used coffee grounds or kitty litter — to make the medication less appealing and unrecognizable — then put them in a sealable bag, empty can, or other container to prevent the medication from leaking or breaking out of a garbage bag. Do you have a few thermometers, tweezers, or thin tubes of ointment that clutter up your cabinet? To save space, put them in an old cup so they can be stored upright. Last but not least, make sure that all your medications are safely out of reach of any children or pets that live in your home or may come to visit one day.